More comfortable; will not interfere with wearer's movements. Eliminates intermittent failures that occur with less durable single and dual wire cords. Allows cart users to ground carts to common grounding point on bench. 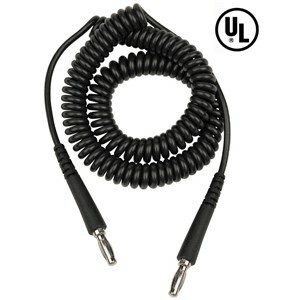 Fits into all standard banana jacks > 0.157" ID Greater retention force; cords won't fall out and put your parts at risk Provides long life, saving money. Longer lasting cord saves money. Independent review of the adequacy of the product's design. Made in America under our control, ensuring consistent top quality. Per ESD Handbook TR20.20 paragraph 5.3.2.2.2 Wrist Strap Ground Cord, "At first glance, the ground cord appears to be a relatively simple assembly. However, the design requirements are considerable, given the wide range of user applications and the durability requirements of constant tugging, flexing, and dragging over the edge of workstation tops and equipment chassis." Reliable Path-to-Ground: Are You Wasting the Money Spent on ESD Control? How Many Accidental Disconnects Occur a Day at Your Plant Putting Your Products at Risk? Read the Evaluation Engineering Magazine Article, "Solving the Wristband Snap Release Problem"